London's Metropolitan Police said the Ecuadorian government had withdrawn asylum for Assange, adding that officers has been "invited into the embassy by the ambassador." WikiLeaks has repeatedly claimed that the Justice Department is building a criminal case centered on the leaking of Democratic emails hacked by the Russians in the 2016 election. Assange, 47, has always maintained that the source of the leaks was not Russia, contrary to the conclusion of U.S. intelligence agencies. Special counsel Robert Mueller recently concluded his probe into Russian electoral interference and the Trump campaign. 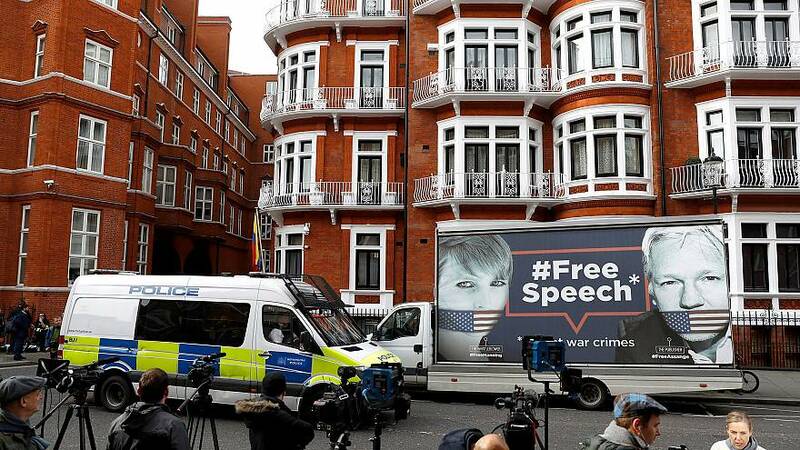 Assange founded WikiLeaks in 2006 and made news four years later with the publication of leaked information provided by Chelsea Manning, a former U.S. Army intelligence analyst and self-described whistleblower. 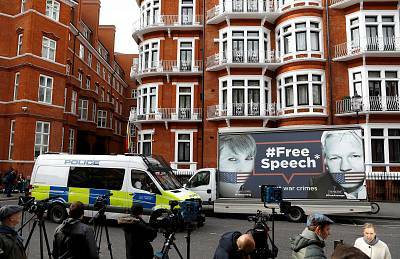 Sweden later dropped its investigation and Assange is no longer wanted there — but he remained in the embassy because London's Metropolitan Police said he would be arrested for violating his bail as soon as he stepped outside. The local force has been running an expensive operation to post officers outside the building in case that happens. Assange became an Ecuadorian citizen last year, even though his relations with his hosts had soured years ago. In January, WikiLeaks sent a 5,000-word email to journalists listing 140 things they should not say about Assange, from asserting that he has been an agent of any intelligence service to that he has ever bleached his hair. Patrick Smith reported from London, and Alex Johnson from Los Angeles.